Stacy Tilton Reviews: Jewelry as unique as you are! Jewelry as unique as you are! Do you like you're jewelry to be unique? Maybe something that's only a few of a kind..or at least won't be on everyone you see at the local supermarket? That's the kind of jewelry that I like. I like to be different and stand out when I'm dressing up to go out. Plus it's always nice to get those compliments of "Oh, your jewelry is so pretty, where did you get it?". That's exactly the reaction I got the very first time I wore my new Glass Geometri Necklace and Glass Triangle Earrings from Dunitz & Company. I absolutely love the set I got, and am very fortunate that I was able to find online a matching necklace and pair of earrings. Many times the pieces sold online only a few of each color left available for purchase, and then they are gone. So I definitely was counting my blessings because I'm one of those people that have to have things that match. As you can tell by looking at the pieces in the above photo they are very unique in appearance, and not like the jewelry you'd find in local mass merchandise stores. And let me tell you the colors are even more beautiful in person. The quality is just amazing to me knowing they are all hand made. I have always been fond of companies like Dunitz & Company and how they go that extra mile to give back to local artisans. It's nice knowing that when I purchase something from them someone else even further down the line is benefiting from my purchase. I’ve been designing and wholesaling my line to brick & mortar boutiques, gift shops and museum stores since the early 90's. Every 6 months we launch new designs and 12 new colors. Some designs stay in the wholesale line for a long time…others do not. We are cottage industry and the artisans create based on the demand from the stores. We always produce extra for reorders. And we always have our initial samples. So, from all of this, we post great designs on our website now for retail. It may be after a season we only have 2-3 pieces or even 1, in any given color. So we offer it on the retail…and then it is gone. Some designs are in the line forever - and we’ll keep adding colors. Other designs we do not. So, once purchased on the retail site, no one will ever find it again. All of our designs belong to us – no one else produces them or sells them. The artisans we work with do not make these designs for anyone but me. 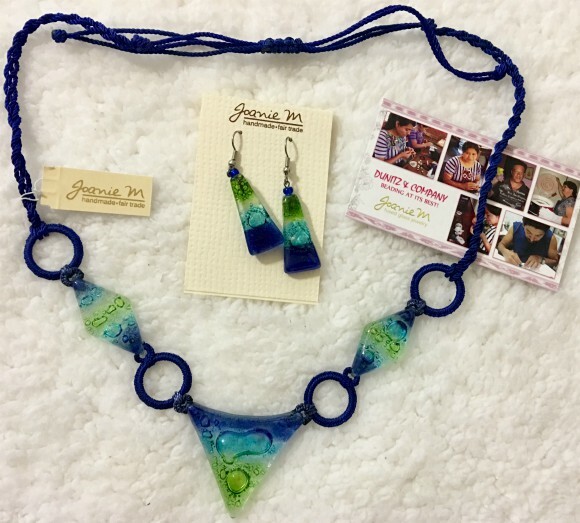 The beautiful fused-glass jewelry line is also handmade in Guatemala. This jewelry is pretty! It reminds me of the jewelry my mother in law would get us while traveling.